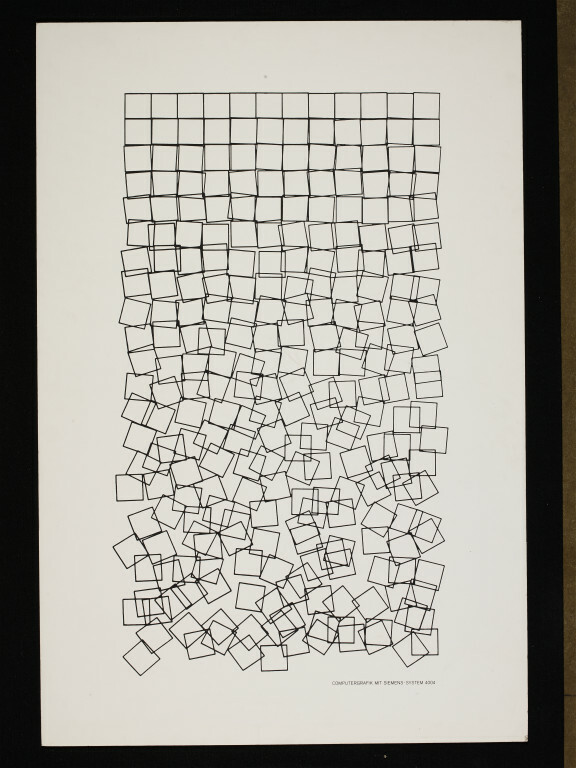 Georg Nees (born 1926, Nuremberg) is considered one of the founders of computer art and graphics. He was also one of the first people to exhibit his computer graphics, at the studio gallery of the Technische Hochschule in Stuttgart in February 1965. Nees studied mathematics and physics at the universities of Erlangen-Nuremberg and Stuttgart. He subsequently worked for Siemens as a software engineer, and was instrumental in their purchasing a 'Zuse Graphomat', a drawing machine operated by computer-generated punched tape. The machine was capable of creating geometric patterns and, although the programming language that Nees used (ALGOL) was designed specifically for scientific computers, Nees used it to create aesthetic images such as this one. In 1969 he received his doctorate on the subject of Generative Computer Graphics under Max Bense, the German philosopher and writer. Along with a number of other practitioners working at this time, Nees was interested in the relationship between order and disorder in picture composition. Here he introduced random variables into the computer program, causing the orderly squares to descend into chaos. Lithograph in black ink on paper, mounted on board. Printed as part of the work. Refers to the computer used to generate the design. 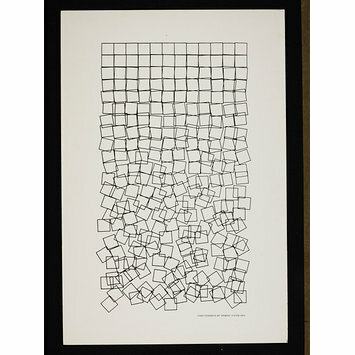 Lithograph in black ink from a computer-generated graphic, 'Schotter', 1968-1970, by Georg Nees. Herzogenrath, Wulf and Nierhoff-Wielk, Barbara, eds. Ex Machina - Frühe Computergrafik bis 1979. Munich: Deutscher Kunstverlag, 2007. ISBN 978-3-422-06689-2. p. 440, ill (cat. 341). 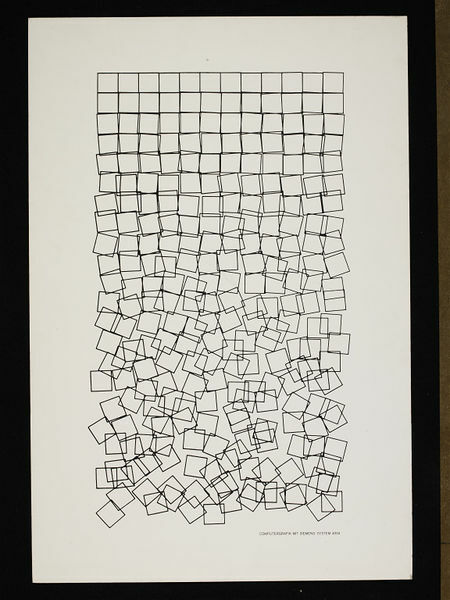 Georg Nees studied mathematics and physics at the universities of Erlangen-Nuremberg and Stuttgart. He subsequently worked for Siemens, where he created some of the first computergenerated images. Nees was fascinated by the relationship between order and disorder in picture composition. To create this work, he introduced random variables into the computer program, causing orderly squares to descend into a heap.